It's a great time of year to spend an evening gazing up at the night sky. Whether you’re a seasoned stargazer or an astronomical newbie, summer evenings are the perfect time to check out the night sky. 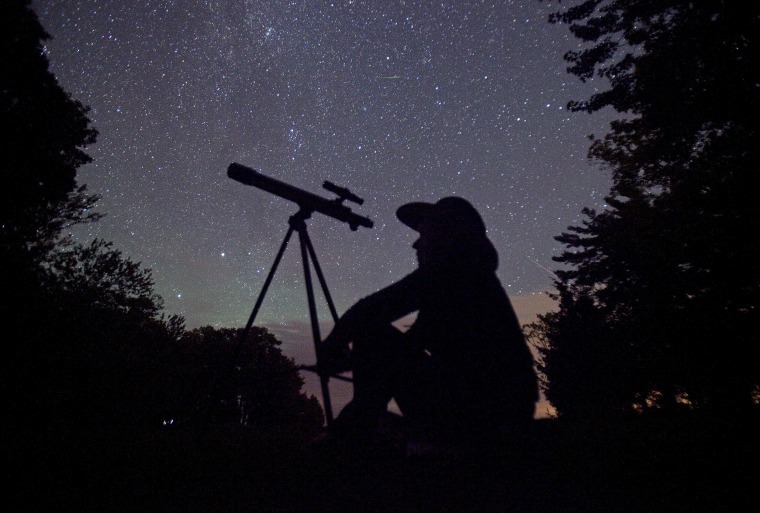 This summer in particular is filled with skywatching opportunities, including a total eclipse of the moon, a spectacular meteor shower and a chance to get up close and personal with our nearest neighbor in the solar system, Mars. Mars is usually the third-brightest planet in the night sky, after Venus and Jupiter. But now through early September, it will be brighter than all the planets except Venus, appearing as a luminous red-orange dot in the southeast sky. This is because in late July, Mars will make its closest approach to Earth since 2003. Earth and Mars circle the sun at different distances, and Earth completes two orbits in the time it takes Mars to complete one. Every two years the planets’ orbits sync up, with Mars and the sun on opposite sides of Earth. This arrangement is known as Mars opposition, and this year it occurs on July 27, with Mars making its closest approach to Earth at 3:50 a.m. EDT on July 31. At that time, the Red Planet will be about 35.8 million miles from Earth; on average, the planets are separated by a distance of 140 million miles. Weather permitting, skywatchers in the Northern Hemisphere will be able to see Mars in the southeast sky anytime after nightfall. The best time to look will be around midnight, when the Red Planet will be visible high in the night sky. July 27 will also feature a total lunar eclipse — the longest-lasting one this century. The eclipse will turn the moon a dull red, but this “blood moon” will be visible only in South America, eastern Africa, the Middle East and central Asia. Total lunar eclipses occur when the moon, Earth and sun are aligned and the moon passes into Earth’s shadow. The eclipse will be visible for 3 hours and 55 minutes, but the period when the moon is completely engulfed in Earth’s shadow — known as totality — will last 1 hour and 43 minutes. Unlike solar eclipses, lunar eclipses present no risk to viewers’ eyes — so there’s no need for protective eyewear. And they tend to be visible along a broader swath of our planet’s surface. For skywatchers in North America, the best bet for viewing the eclipse will be online. TimeAndDate.com is hosting a livestream starting at 2 p.m. EDT on July 27. The annual Perseid meteor shower returns every August, and it tends to be one of the year’s best sky shows. This summer the Perseids will be active from July 14 to Aug. 24, with peak activity occurring overnight on Aug. 11 and Aug. 12. On these nights, skywatchers could see up to 100 “shooting stars” an hour. The Perseids arise when Earth passes through the debris of Comet 109P/Swift-Tuttle, which was first discovered in 1862. The comet’s last brush with the inner solar system occurred in 1992, leaving a dusty trail of debris that our planet passes through each summer. As these bits of rock hit Earth’s atmosphere, they burn up and create visible streaks in the sky. In the Northern Hemisphere, the Perseids are best viewed during the predawn hours. The meteors appear to originate from the constellation Perseus, which is visible in the northeast sky. No special equipment is needed to view the Perseids. Just find a place with an unobstructed view of the sky, away from bright lights that can drown out the shooting stars. Then sit back and enjoy the show.